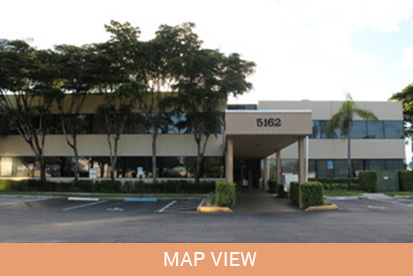 Our office is conveniently located just east of the Delray Medical Center/Delray Hospital, on the southwest corner of Military Trail and Linton Boulevard. It is a two-story tan building adjacent to Palm Court Plaza. Linton Boulevard is an exit off of I-95. From the Turnpike, take either the Glades Road or Atlantic Avenue exit. From the East: Go west on Linton Boulevard. Just after Military Trail, take your first left into Palm Court Plaza. Make a right at the stop sign and it is the two-story tan building straight ahead. From the West: Go east on Linton Boulevard. Just after the Delray Medical Center but before Military Trail, take a right into Palm Court Plaza. At the stop sign, make a right and it is the two-story tan building straight ahead.